Food and Fluid for your Marathon. Running a marathon distance of 42.2km requires extensive training and preparation to enable your body to be physically and mentally ready for the challenge. The right diet can support the body through high training loads and help to prepare for and see you through the big event. With your marathon on the horizon, training will challenge your body both physical and mentally. It is vital to support your training with good nutritional practices. Distance runners require high energy intakes to all the body to undertake long, intense training sessions. Carbohydrate is the most critical fuel source for marathon training and is store in the liver and muscles as glycogen. These fuel stores are limited and need regular replenishment. As training load increase and you start running longer distances, the amount of carbohydrate you eat also needs to increase. It is important to base all meals and snacks on foods that are high in carbohydrates. Moderate amounts of protein are important to support and repair your muscles. Protein intake is usually proportional to total calorie intake, so the more food you’re the more likely you will meet these needs. Aim to include a good source of protein at lunch and dinner: consume milk regularly throughout the day and include sources of protein in some snacks. During training you lose fluid through sweating. Unless these fluid losses are replaced by drinking, you run the risk of becoming dehydrated, which can cause fatigue and impair your performance. Aim to drink regularly throughout the day and begin each training session well hydrated. Keep an eye on the volume and colour of your urine as a measure of hydration status. If you are passing less urine or the colour becomes darker than normal, than you may not be drinking enough fluids. For runs longer than 1 hour aim to drink 100-150ml every 15-20 mins or at a rate that is comfortable. An isotonic sports drink may help to replace fluids and provide a source of carbohydrate during longer runs. To assess fluid losses post exercise, it can be helpful to weigh yourself before and after your run. Remember to take into account any drinks you have consumed. Aim to replace 150% of any with lost within 4-6hours e.g. 1kg weight loss = 1.5L fluid. Increase the number of eating occasions (6-8 times/day). Base all meals and snacks on foods that are high in carbohydrates. Eat 5 portions of fruit and vegetables daily to ensure adequate intake of vitamins and minerals. Reduce your intake of high fat foods e.g. chocolate, cakes, biscuits, fried foods etc. Training is a good time to experiment with the type and timing of food you consume before running in order to avoid any digestive discomfort like stomach cramps, diarrhoea or wind. It is important to trial different carbohydrate replacement strategies (sports drinks, gels or bars etc.) during training runs to make sure they do not upset your tummy or give you diarrhoea. Training is a good opportunity to practice fluid replacement in terms of timing, amount and type of fluids e.g. water, isotonic drinks or diluted fruit juices. Remember to choose a snack containing both carbohydrate and protein within 20-30 min of stopping training. Ensure adequate rest between your training sessions. Ensure your last meal the day before the marathon is high in carbohydrate with a lean protein source. Eat what worked for you during training and avoid trying new foods at this late stage. Drink enough fluids the day before and morning of the marathon to ensure you are hydrated. 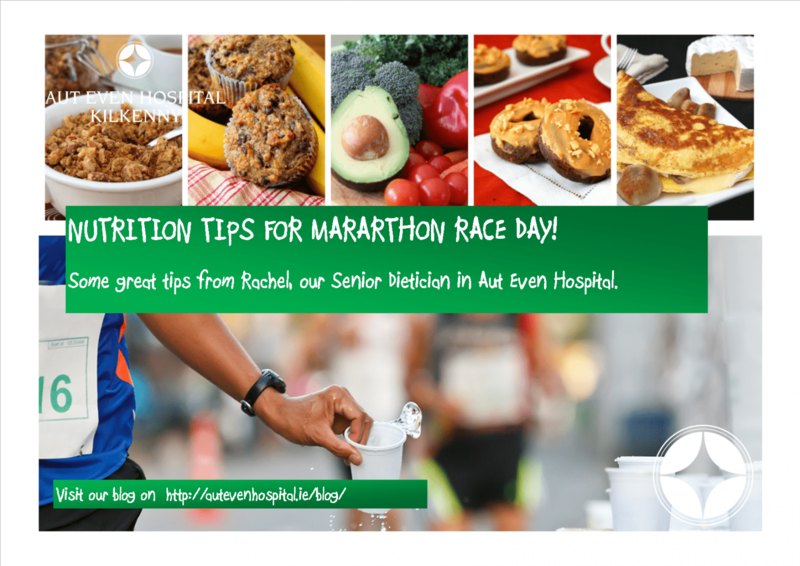 A high carbohydrate (low fibre) breakfast should be eaten 2-4 hr before a marathon e.g. Breakfast cereal (e.g. porridge/muesli/shredded wheat) + low fat milk and/or toast + low fat spread + jam/honey. Extra snacks can be taken approximately 1hr before the race to ensure you are fully hydrated. Drink fluids regularly throughout the race e.g. 100 – 150ml every 15 min during the race. Water is usually available however isotonic drinks are the most suitable way of getting both fluids and carbohydrate at the same time. Take 30 – 60 g of carbohydrate every hour e.g. REFULE energy stores with carbohydrate! REPAIR muscle tissue with protein! REHYDRATE body fluids with fluid and electrolytes! Eat a recovery snack high in carbohydrate, with a source of protein within 30 minutes after finishing the race. Choose easy to digest foods that are low in fire and fat e.g. Have a follow up meal containing carbohydrates and some protein within 2 – 4 hours of finishing the race e.g. Replace fluids and electrolytes by drinking fluid slowly over the next 24 hours. Don’t wait until you feel thirsty to have a drink.